Currently, Win Marketing is working on large-scale market research project for a client who wants to get to know its customers better. This type of market research can be incredibly valuable to a company, as it can help to improve sales over time by informing your marketing strategy with useful information about your customers’ wants and needs. Content marketing is more than blogging; for a successful online marketing strategy, your brand should include engage visual content, as well. According to Inc.com, 84% of communications will be visual by 2018. So, now is the time to start integrating interesting visuals into your content marketing strategy. 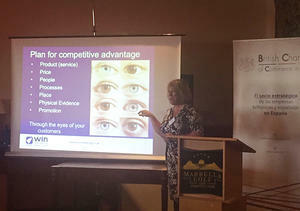 Ann Goodwin recently gave a talk at The British Chamber of Commerce in Spain at the Marbella Golf and Country Club. Part of a marketing seminar: Empowering Your Business in the Digital Age, Ann gave a 15-minute toolkit talk on marketing with a competitive edge. Over the years, we have created successful and engaging campaigns for many clients in this industry, and MD Ann Goodwin regularly hosts seminars to help companies communicate their health and safety message more effectively by using marketing strategies. Christmas is the busiest time of year for consumers, and it is important for your brand to get involved in the festivities. Here are some tips to help drive your sales during the holiday season.